Effect: A necklace of colored beads is shown around the performer's neck, or introduced from your pocket as your Magic Beads. A person names a number between 1 and 20. Say they chose the number 12. One end of the beads is taken by the spectator, the other end is held by the performer or someone else. The person is asked to concentrate on their number. You tell them when they get the urge, they are to pull or tug on the beads they are holding. They pull, and believe it or not they are left holding the exact number they chose. Can be repeated immediately. Wait till you see the smiles on their faces! Can be done over and over for the same crowd. Nothing added or taken away. 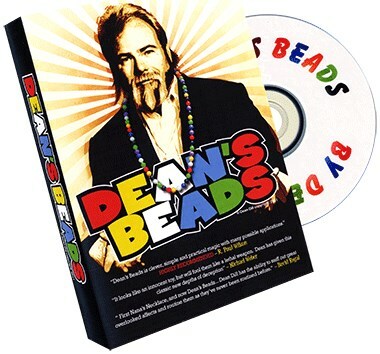 I have been performing Dean's Beads for over 25 years. I can attest to the fact that this is always a winner. Very seldom do you find a simple trick that not only amazes your spectators but is asked to repeat over and over for the same crowd. Kids love it. Adults love it and I love. Now that I told you in my very own words, I will let this item speak for itself.